Bourbon Pig cocktail at Umamicatessen's Back Bar. Four restaurants, one coffee shop (Spring for Coffee*), one bar under one roof. That’s the new Umamicatessen spot which just soft opened in Downtown this past weekend. But what may be regarded as foodie heaven for some –what with its one-stop eating of Umami Burger, Pigg (pork-focused eatery by SF chef Chris Cosentino), & a Donut (made-to-order donuts), and The Cure kosher-style deli — it actually sounds a bit nightmarish for any mixologist to create a drink list that can work with all restaurants’ dishes. But Umamicatessen’s cocktail guru Adrian Biggs (La Descarga, Harvard & Stone) had this in the bag, deciding to keep things simple. “I didn’t want to overcomplicate because we have so much going on. We have eight different burgers, we have amazing delicatessen items, desserts, salads, etc. And if you overcomplicate the cocktails you’re just left with everyone fighting against each other,” he said. Good point. So instead he created a few palate cleansers (“Dryer and gets you salivating”) as well as cocktails with umami. 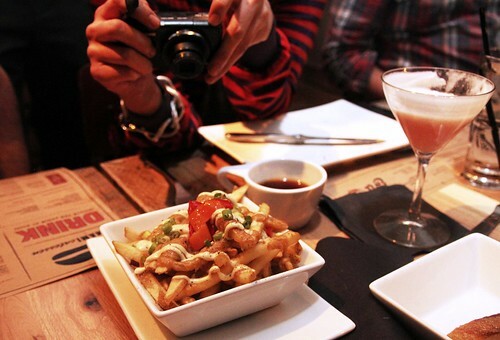 Fries with brainaise and Red Sapphire cocktail. So what would he pair with the Umami Burger (shiitake mushrooms, caramelized onions, roasted tomato, parmesan crisp and umami ketchup)? Now, since I’m still in the throws of my “Lent”-imposed vegetarianism, I couldn’t test his pairings out. But I will say that, although both tomato and celery are on my list of most hated foods, the Teal Goose and the Michi-mami were both well-balanced. And zowee does that Michi-mami have a kick. Would be a perfect way to start a morning. 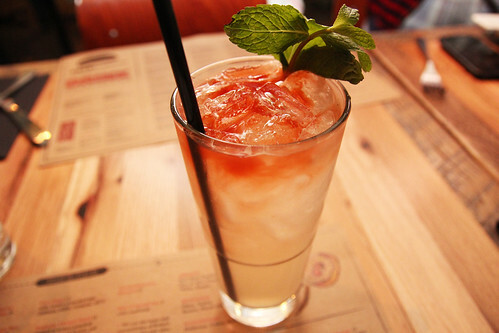 Velvet Mule: vodka, Velvet Falernum, lime, ginger beer, Angostura. Out of the cocktails I did try during the Friends & Family night last Friday, my faves have to be the 9th and Broad (Woodford Reserve bourbon, Carpano Antica formula, apricot liqueur and Jerry Thomas decanter bitters) — an apricot-y Manhattan — and the Velvet Mule with Beluga vodka, Velvet Falernum, lime juice, ginger beer and Angostura. Now, if I ever return to eating meat, I definitely would give the Bourbon Pig cocktail a go. Hullo? An Old Fashioned with bacon fat washed Bulleit bourbon? Yes, please. 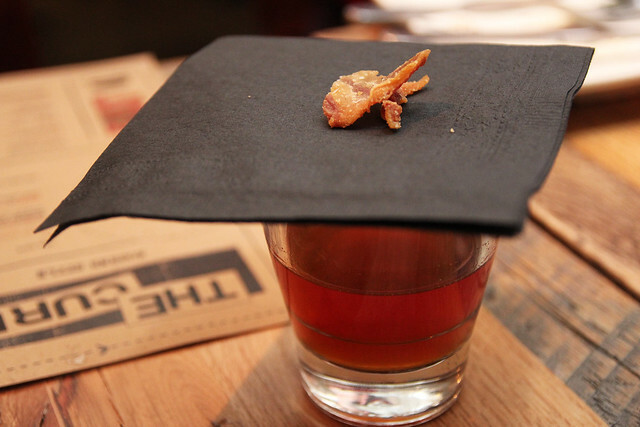 Bacon bourbon will never go out of style for me. Another big hit was the mescal lemonade slushee, which despite its medium, didn’t water down the mescal. You could still savor its smokiness and potency. The night of the party, it was such a big hit with Adrian’s visiting bartender friends. 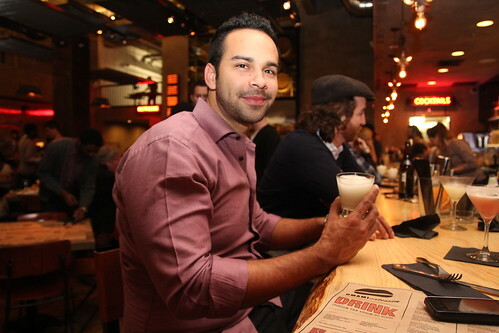 And L.A.’s best bartender (via Eater LA) Julian Cox (Rivera, Playa, Picca, Sotto, Short Order) gave it his nod of approval. That’s high praise indeed as that guy KNOWS mescal! Julian Cox luuuves the mescal lemonade. There are more cocktail slushees in the works as Adrian said that they’ll continue to use the machine to showcase “classically inspired cocktails in the slushee format.” Think a Dark & Stormy (ginger rum slushee), or for summer a Peachy Collins with “some sage or some rosemary to help add some herbaceousness to it.” Perfect for a sultry evening. If you want to see Adrian in action at Umamicatessen, you better stop by now as he’ll only be there for the first month. Not to fret, though, as he says he’s trained his staff, who come from varying backgrounds of beer bars and nightclubs, well. But when Adrian goes, won’t the bartenders return to their wicked shortcuts, you ask? Adrian has taken precautions, enacting a secret shopper program where he will get his friends like the highly esteemed David Kaplan and Alex Day (Death & Co, Bar & Kitchen) to stop by regularly, telling them “I’ll get your meal, but watch and quickly email or text message and report back.” Fortunately, the Back Bar bartenders have no problem with that as they said they love getting pointers since they all want to be better. Aww. The cocktails range in price from $10 to $12 and they also have 10 beers on tap and a nice bottle list. Wine is also available, a mix of 30 bottles of red, white, rose, sparkling and sake for $28 each. Umamicatessen is currently open for limited service til its grand opening later this month. So you might want to give them a call before you stop by. * Spring for Coffee happens to offer boozy coffee choices like Irish Coffee, Mexican Jumping Bean and Governator. Photos of the Umamicatessen Friends & Family night after the jump. 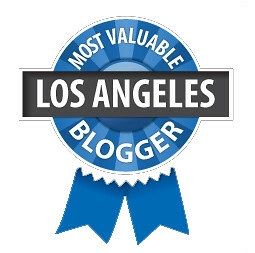 Caroline, you impress me with every blog discovery you share… I can’t wait to go downtown and try out this cool hot restaurant/bar… thanks!